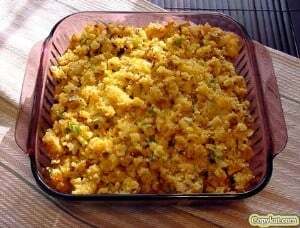 Home » Main Dish Recipes » My Grandmother’s Dressing – this is a perfect addition to a Thanksgiving dinner. My Grandmother’s Dressing – this is a perfect addition to a Thanksgiving dinner. This true southern recipe for dressing has been in my family for several generations. It does take some time to make, but it is well worth it. Thanks to KellyK for submitting this recipe. My Grandmother's dressing is the perfect addition to your big meal or holiday. Cook celery and onion in butter and 3 cups of chicken broth until tender. In a large bowl crumble cornbread. Pour cooked celery and onion mixture over this and mix. Add breadcrumbs, celery soup,1 can chicken soup, eggs, remaining broth, and about 1 1/2 tablespoons bouillon (or to taste). Mix these ingredients together. SEE NOTES Bake 350 degrees in a very large casserole for about 45 minutes to an hour. Helpful Notes-- The consistency should be soft (a little bit soupy), NOT stiff. If the consistency is too stiff, add more soup. Also, taste to make sure you have enough onion, pepper, etc. You may need to add some *onion powder*, more bouillon, or black pepper. I made this over the weekend. My family liked it!